Our Farmer's Market smells like orchard lately: peaches are in it's season. Baskets filled with a velvety fruits and delicate aroma invite the visitors from many stands. We've been eating peaches for breakfast, lunch, and dinner, and in between for two weeks. Our home is perfumed with a lovely peach aroma. I am experimenting with peaches in unusual (for us) meals. 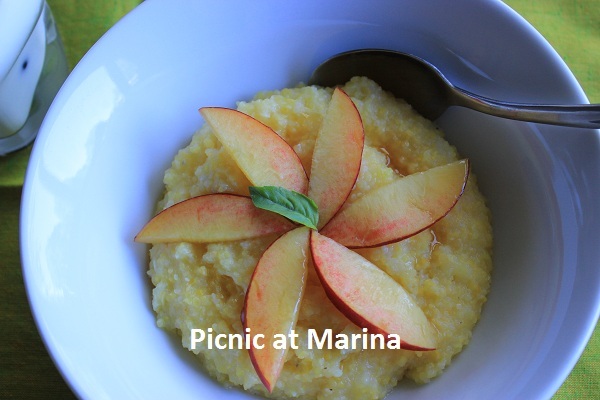 For example: polenta for breakfast with peaches and agave nectar. Easy, but healthy and delicious start of the day. Why it is unusual? Because we eat polenta with cheeses, mushrooms, vegetables, in other words savory. Cook polenta following the instruction on the package, and serve with peach slices and agave nectar. Dear friends, have you made an unusual meal with the peaches? I love peaches and this sound delicious! What a great way to start the day. I would have never tought of polenta!!!! It looks very good! i have quite a bit of polenta in the cupboard too - peaches aren't in season here but there must be something that would work in their place that is....will have to have a think. This sounds fantastic- I've never had a sweet polenta but it would be very yummy. I can't wait for peaches to be in season here! no--but i would love to have some peaches with real cream--beautiful pic! I've been starting a peach craze too. Like the idea of pairing them with polenta - nice contrast of flavors. And an excellent idea for breakfast. Nice post - thanks. Hmm, polenta with peaches actually sounds really good to me. I think I will experiment with it too. 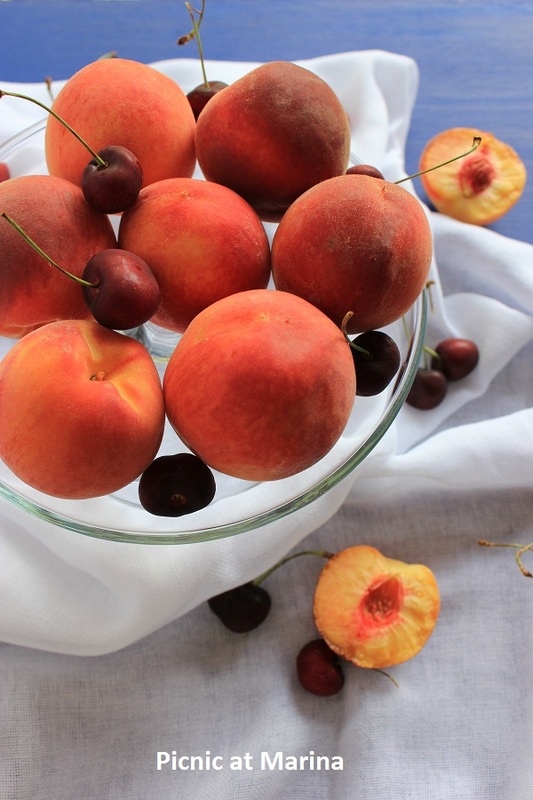 I haven't made anything unusual with peaches but I am definitely trying your Peaches & Polenta! Looks and sounds yummy! Peaches are not yet available at our farmers' market, I am hoping they will be soon. We have the best tree ripened peaches in the stores right now. I eat them on cereal or oatmeal...or by themselves. I have never made polenta...now I'm wondering if I would like it! I also use polenta for savoury dishes, so this is unusual also for me. But it sounds sooo good that I have to try it for breakfst with some fruits :-) Thanks for inspiration. I love this application of the polenta. Warm and comforting drizzled with sweetness and juicy fruit. I'd love to start any day this way! That sounds like a wonderful breakfast, I'd love to start the day off with fresh juicy peaches.